London Calling! Move without pausing to the Old Operating Theatre. What’s that you say bibliodeviant? This isn’t another post where you wax all pretentious about how much you really, really like books? Because we weren’t sure whether you liked books or not…it’s always so difficult knowing what to get you for your birthday…if only you like books it would be easy. 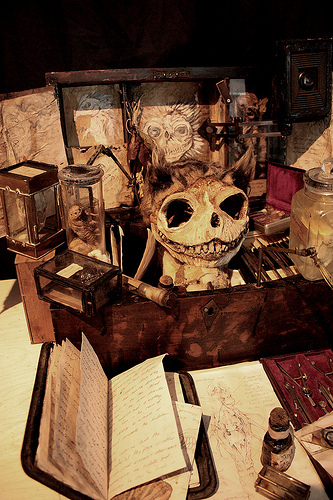 Yup, that a weird collection of Lewis Carroll related strangeness, and yes, that is the Cheshire Cat’s skull…Now move along. The true splendour of this man’s exploits can be summed up by me saying that he once exhibited a sample case and expedition trunk reportedly salvaged from the Challenger expedition to Maple White Land. The expedition detailed in Doyle’s The Lost World. It had a Pterodactyl wing in it…A Pterodactyl wing. And…he is having a Splendid and Thrilling Exhibition of His Breathtaking Wonders, in London, at the Old Operating Theatre near London Bridge. 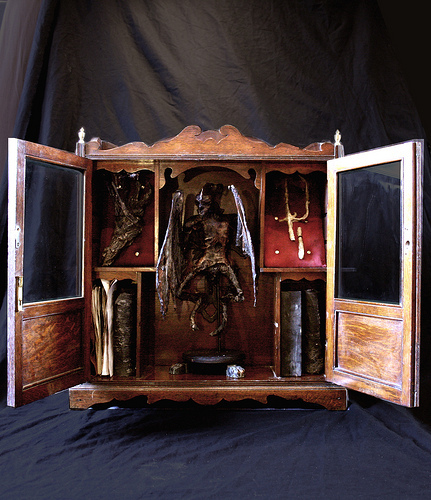 Alex CF offers the public a unique opportunity to see his bizarre crafted specimens in the setting of the Old Operating theatre. 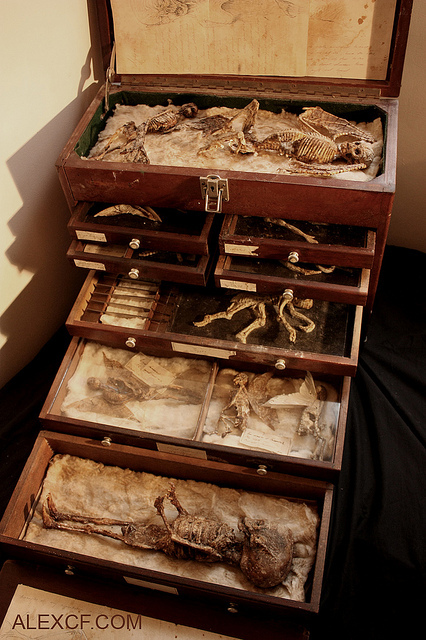 A collection of 19th century biological specimens of species thought to be the stuff of legend, from Vampires to dragons, their preserved remains and enigmatic stories the life’s work of curator and custodian Alex CF. Everyone who can should go along to this exhibition. There are reasons, obviously, many dark arcane possibly terrifying reasons. Reasons that man and woman should not expose themselves to without the correct application of protective sigils, and gin. The fact that I want this badly enough to be reduced to making incoherent grunting noises doesn’t say anything bad or strange about me does it? Reasons like the fact there are far too few people doing things like this in a world where there are far too many people eating at Chick Fil-A and obsessing about other people’s sexual habits and being inappropriately intrusive into what deity other people worship. Visit this exhibition, worship Cthulhu, read books. Between the two of them there should be some sort of quite spectacular but ultimately damaging cosmic event caused by the achievement of a particularly arcane brand of creative critical mass. I’ve changed my mind, I hate both of them. And fear. Fear and hate in equal measure. But I’m still going to the exhibition. More than once. I’ll be the badly dressed Victorian nerd in the corner, the one with all the empty space around him, enveloped in the alluring scents of juniper and formaldehyde.